Things began to get better: The economy improved; There was a return to building, cathedrals, universities, cities...; a return to “luxuries” - paper, plays, music...; a return to invention - the compass, printing...; a return to exploration - Africa, the New World, the Pacific.... It was the renaissance, which we date (roughly!) from 1400 to 1600 or so. They were vigorous times, interesting times, dangerous times! The aristocracy had won the day over the fledgling monarchies and even the church’s heavy hand, at least for now. So there were just tons of these upper-crust types, often with lots of money, totally in love with the idea of themselves. Religious and other thinkers were freed, to one extent or another, from the powerful central authority of the church to create their own, very reasonable or totally outlandish, religious philosophies. And merchants found that money can buy almost anything, including the traditional respect that the aristocracy received. In fact, aristocratic title and merchant wealth were a perfect combination for a good marriage! These aristocrats and merchants believed in the "perfectibility" of mankind: We could become better human beings! Most importantly, we could become more powerful, richer - more aristocratic, if you will. Much attention was paid to behaving like a gentleman or a lady, as reflected, for example, in Baldesar Castiglione’s guide to proper conduct, The Book of the Courtier. They were practical, interested in real events and real people in the real world. Individualistic and competitive (and very “dog eat dog”), they liked their politics and they liked to play rough. But, they were also anti-intellectual, even cocky in their ignorance. They tended to think of scholars as dry, impractical types, who might be able to forecast eclipses, but probably couldn’t tie their own shoes, much less make money or run estates! And they were superstitious, spiritualistic, fascinated by astrology, ancient Egypt, the Kabbalah, alchemy, magic - a Renaissance version of our “New Age” movement. Two events in particular stand out as representative of the renaissance: The first was printing. Johann Gutenberg (c 1400-1467) of Mainz invented the printing press and movable type, and printed the Gutenberg Bible in 1455. The second was the discovery of the New World, which meant lots of gold and silver and a stoked-up international economy, as well as an outlet for those discontented with life in Europe (“Lebensraum” - room to live, as the Germans call it). This, of course, is usually credited to Christopher Columbus (1451-1506). Another aspect of the renaissance was its humanism, meaning an interest in or focus on human beings and their well being, here and now, rather than in God and the afterlife, or the activities of saints and Biblical heroes of eons ago. Petrarch (1304-1374), for example, wrote history with an emphasis on personality, and is often considered the first humanist (at least since the ancients!). There were several philosophers in the early renaissance who particularly express this idea of humanism. Giovanni Pico della Mirandola (1463-1494), for example, believed that the philosophers (that is, Plato and Aristotle) and Christianity basically agree. He argued for free will and saw mankind as the connection between the physical world and the spiritual world. Desiderius Erasmus of Rotterdam (1467-1536) recommended a compromise between faith and humanism, and tried hard to prevent the excesses of the reformation. A strong believer in free will, he wrote against the concept of justified wars, and asked his readers to exercise tolerance, friendliness, and gentleness. Sir Thomas More (1478-1535), friend of Erasmus and chancellor to the infamous King Henry VIII, wrote a story called Utopia, in which he described a perfect society much along the lines of Erasmus’ compromise between faith and humanism. When he refused to recognize his sovereign as the head of the English church, said Henry VIII had him beheaded. The Catholic church made him a saint. Niccolo Machiavelli (1469-1527) had quite a different outlook on things than these philosophers -- still, however, typifying humanism. He wrote about hardball politics in a book called The Prince, 1513. His reputation became so negative, that “Old Nick” became a nickname (yes, also from Niccolo) for the devil himself. But few people realize that he followed up The Prince with The Discourses, in which he discusses democracy as the political system he would prefer to see! I myself think he deserves credit as the first social psychologist. And this was particularly the heyday of artists and authors. Among the artists were Leonardo DaVinci (1452-1519) and Michelangelo (1475-1564) in Italy, and Albrecht Dürer (1471-1528) in Germany. Later in the renaissance, we have El Greco (1541-1614) in Spain, and later still, Rembrandt van Rijn (1606-1669) in Holland. Among the literary types we had Montaigne (1533-1592) in France, Cervantes (1547-1616) in Spain, and none other than William Shakespeare (1564-1616) in England. There were many others. In the Middle Ages, the ultimate authority was pretty clearly God, and the pope was his mouthpiece. Heresy was not uncommon, of course, but excommunication and monastic imprisonment were the major punishments. Then, in 1215, came the Inquisition, and heresy was punishable by death. Spain in particular was a land of religious fanatics. Torquemada, the Grand Inquisitor of Spain from 1483 to 1498, made the Spanish Inquisition a household word. Martin Luther (1483-1546) posted his 95 Theses (points of disagreement with the way the church was doing things) on the door of the castle church of Wittemburg. 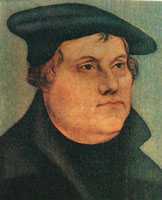 His Theses focused on the sale of indulgences and denied the primacy of the pope. He emphasized the idea that we are born in sin, our lack of free will, and our absolute need for the grace of God. Luther furthermore translated the Bible into German, and his dialect became the basis for standard literary German to the present day! He also wrote some pretty nasty papers condemning peasants and Jews. On the other hand, Philip II of Spain (ruled 1556-1598) wished to restore Catholicism to its former glory. His domestic policy consisted of encouraging the inquisition - resulting in the mass burning of heretics and severe oppression of remaining Moors and Jews in Spain. Philip was especially ticked off by the war for independence, led by Protestants, of the Netherlands from Spain. Elizabeth I of England (ruled 1558-1603), whom he courted, secretly encouraged piracy against his fleets, which were coincidentally bringing loads of silver from the new world. The hostilities culminated in the destruction of his Great Armada in 1588. The reformation lead the Catholic church to reform itself, but not before executing a very large number of Protestants for heresy. The Protestants executed Catholics and other Protestants as well. Catholic or Protestant, these were not proud days for religion! In Mathematics, a number of advances were made: Francis Pellos of Nice invented the decimal point in 1492. Thomas Harriot, the astronomer who discovered sunspots, created what are now the standard symbols used in algebra. John Napier of Scotland invented logarithms, which in turn permitted the William Oughtred to develop the slide rule - which could be considered a simple analog computer - in 1622. Descartes himself invented analytic geometry. Biology and medicine also had a few breakthroughs: Peracelsus (Theophrastus Bombastus von Hohenheim was his real name! 1493-1541) recognized that life was based on chemical and physical sources, and should be explained thus. In 1553, Michael Servetus - the same one that Calvin had burned at the stake in Geneva - discovered pulmonary circulation. William Harvey (1578-1657), physician to King James I and King Charles I (and Francis Bacon, below), explained the circulation of the blood for the first time. He also promoted the idea that every animal comes from an egg - in an age when spontaneous generation of flies was the established belief. Instrumentation drove much of the progress in science. The compound microscope was invented in 1595 by Zacharias Janssen of Middleburg in Holland. The telescope was invented by his neighbor, a German named Hans Lippershey in 1608. Galileo invented a thermometer in 1603, and his student Evangelista Torricelli invented the barometer in 1643. And then there were the great astronomers! 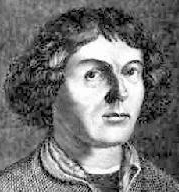 Nicholas Copernicus of Poland (1473-1543) introduced the heliocentric solar system. The church, of course, asked why would God not put us - his special creation - in the center? How can this be reconciled with scripture? And doesn’t this conflict with direct experience? Johannes Kepler 1571-1630 added the laws of planetary motion, i.e. that they have elliptic, not circular, paths. Note that this implies something less than perfection - certainly not what God would do, even if he did put the sun in the center! 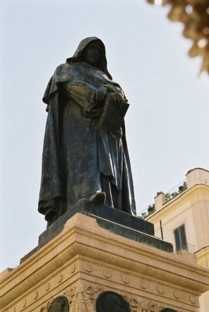 If astronomers were having a hard time with the church, heaven forbid you elaborated on Copernicus: Giordano Bruno (1548-1600), of Nola near Naples, believed in an infinite universe without center, with innumerable earths traveling around innumerable suns, each with plants and animals and people. And he was a pantheist. Pantheism is the belief that God is found throughout nature, that he is, in fact, identical with the universe. When people say “God is in everything and everyone,” they are in fact making a pantheist statement that could have gotten them killed until fairly recently! He had a particularly powerful effect on Spinoza, whom we will discuss in the next chapter. After a brief stint as a Dominican monk, he wandered around the cities of Europe until a Venetian aristocrat invited him to return. That same aristocrat turned him in to the Inquisition in 1592. He was imprisoned for eight years, but refused to recant. Finally, on February 17, 1600, he was burned at the stake in the Square of the Flowers in Rome, naked and with a nail through his tongue. In 1889, a statue of him was erected in that same square, and his death commemorated by free-thinkers world-wide every year since. Francis Bacon (1561-1626) was born January 22, 1561. His father was “Lord Keeper of the Royal Seal,” under Elizabeth I, something similar to the Secretary of the Treasury in the US President’s Cabinet today. When his father died early, he was left without an estate, and so went to study law. At the ripe old age of 23, he was elected to Parliament, where he was a strong advocate of religious toleration, and his fortunes began to improve. In 1607, King James I made him Solicitor General; in 1613, Attorney General; and in 1617, Lord Keeper of the Royal Seal! The following year, the King made him a Baron and the Lord Chancellor -- basically the King’s right hand man. His real love, however, was science and philosophy. He wrote Novum Organum of 1620 refined the art of logical thinking, and proposed a “new method” for science. Bacon suggested that we use induction -- working from facts to theory (instead of from theory, or the Bible, to “facts”). He was wary of hypotheses - which he felt were as likely to be superstition or wishful thinking than anything else - but in fact suggested what we would now call the testing of hypothesis in the form of a process of elimination of alternative explanations! In 1621, soon after the King raised him to Viscount, the Parliament impeached him for taking bribes. He had indeed taken many bribes - but so had everyone else, so the impeachment was really a political slap at the King. But, being out of political office allowed him to continue full time the science and philosophy he loved part time. He began a project, with the help of the King, called The Great Renewal, which was to be a review of all the sciences. 1. Idols of the Tribe. The tribe he is referring to is us, the human tribe. So the idols of the tribe are our natural tendencies towards bias, such as reading our own wishes into what we suppose we see, looking for patterns or a purpose to everything, and so on. 2. Idols of the Cave. The cave is the little box we each live in as individuals. So the idols of the cave are the distortions and biases we have as individuals, such as those based on our peculiar backgrounds and educations, as well as the intellectual heroes we emulate. 3. Idols of the Marketplace. The marketplace is society, and the main threat to clear thinking from society is its use of language. The common uses of words are not necessarily fit for scientific and philosophical use, and “common sense” or the logic we presume we are using when we speak is not that logical. And words can exist that have references that do not exist - a great root of confusion. In 1624, he published The New Atlantis, a utopian fiction about an island in the South Pacific ruled by scientists. They lived in a university-like setting called Salomon’s House (after their founder), and were chosen for their position by tests of their merits - just like the philosopher-kings in Plato’s Republic. This may have been the model for England's Royal Society (of scientists). In The New Atlantis, incidentally, he predicted quite a few modern inventions, including cars, planes, radio, and anesthetics. Bacon died in 1626, at the age of 65, after catching cold while experimenting with preserving chicken by freezing. He is considered the father of British philosophy, and the intellectuals of France dedicated their monumental Encyclopédie to him in 1751. Galileo Galilei (1564-1642) was born in Pisa, Italy February 18, 1564, the same year as William Shakespeare was born, and the same day Michelangelo died. When he was 18, he discovered the principle of the pendulum. At 22, he invented the hydrostatic balance. Perfecting his telescopes, he managed, in 1610, to discover four of the nine moons of Jupiter (the Galilean moons! ), the rings of Saturn, and the phases of Venus! He is most famous, of course, for the law of gravity, stating that two things of the same size and shape, but of different weights, will fall at the same speed through the same medium. That he demonstrated this by dropping things off the leaning tower of Pisa is probably a myth -- but who knows? On the philosophical front, he was the first to make the distinction, which would become so important in English philosophy, between primary and secondary qualities. Primary qualities where physical properties of matter that could be measured, and therefore be made the subject of scientific analysis. Secondary qualities, on the other hand, were things that required the presence of a conscious, living creature: tastes, odors, colors, sounds... Only if these could be converted into primary qualities could they, he believed, become the subjects of science. Galileo considered Copernicus’ theory as a proven fact, and taught it as such. The church, however, and especially the Jesuits, would only accept it if stated as a hypothesis, in the same way that some fundamentalists today will only tolerate the teaching of evolution if it is presented as just one theory among many. ...(N)othing physical which sense-experience sets before our eyes, or which necessary demonstrations prove to us, ought to be called in question (much less condemned) upon the testimony of Biblical passages which may have some different meaning beneath their works. ...I do not feel obliged to believe that that same God who has endowed us with sense, reason, and intellect has intended us to forgo their use. For more from the same letter, click here. In 1616, the Inquisition told Galileo to stop teaching Copernicus’ theory, and in fact condemned all publications and books, by any author, that did so. Galileo, probably recalling Bruno’s fate only 16 years earlier, quieted down. An essay by a student of his got things upset again, so Galileo spoke to the Pope himself. The Pope wouldn’t budge. At 68, he was, over four interrogations, threatened with torture (though not tortured), and asked to recant. He refused, a little less intensely each time. They pronounced him guilty of heresy. Eventually, he was put under house arrest, but otherwise free to teach and write. He was lucky. 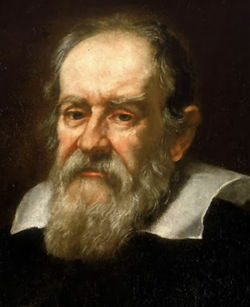 Galileo died January 8, 1642. Science suffered quite a blow in the Catholic countries, with many scientist fearful of stating their views. This moved the center of scientific discovery to the Protestant North, not because Protestantism was more tolerant of science, but because the churches of those countries had less legal authority. In 1835, the church did finally take Galileo’s books off the banned books list. The church apologized in 1999. Rene Descartes (1596 - 1650) was born March 31, 1596 in La Haye, France, the son of a wealthy lawyer. Sadly, his mother contracted tuberculosis a few days after his birth and died. The baby nearly died as well, and Rene remained a weak child. After a good Jesuit education, at 17 he began to wander Europe, including a stint in the Bavarian army. In 1628, he moved to Holland, where he stayed for most of his life. Rene never married, but he did have a mistress and a daughter, who died at the age of five. His major contribution, for which he will forever be known as the father of modern philosophy, is the method of doubt. In his book Meditations, he decided to start philosophy from scratch by doubting everything he could - things, God, self, the church, Aristotle... - until he found something he could not doubt and from which he could build a new philosophy. His conclusion was, of course, that there was one thing he could not doubt: The fact that he was there doing the doubting! Cogito ergo suum, I think therefore I am. From there, he went on to conclude that there were a number of things equally certain: God, time and space, the world, mathematics. These things, he said, were innate-- in-born - to the mind. You derive them not from experience but from the nature of one’s mind itself. For a selection from Meditations, click here! But there’s more to Descartes: He was a mathematician as well as a philosopher, and he made a variety of mathematical discoveries, most especially analytic geometry (applying algebra to geometry - remember Cartesian coordinates? ), which he supposedly discovered while in what he called a stove - perhaps a sauna. He was also a scientist, and made a number of innovations in mechanics and optics as well. And he was the first to note the idea of the reflex. The idea that some of our actions are reflexive leads inevitably to the possibility that all actions are reflexive. Descartes theorized that animals (at least) have no need for a soul: They are automatons. Being a good Catholic, he exempted human beings. We do have a soul, although he acknowledged that he did not know how the soul and the body interacted. In history, people use what is most interesting around them to theorize about other things, especially themselves. Today, everyone talks about psychological issues using computer analogies and information processing models. In Descartes’ day, it was the mechanics of clockworks and hydraulic systems that were the cutting edge of technology. So he and others basically suggested that life - including at least much of human life - was mechanical, i.e. functioned by the same natural laws as did physical entities. 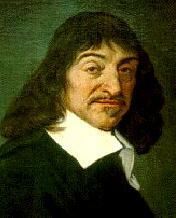 Descartes went one step further: He made the deist hypothesis. He suggested that (outside of the human soul and free will) all of creation works mechanically, and that God designed and set it all in motion - but certainly would have no need to step in and intervene once things are going. Of course, that says God would have no need of miracles, that Christ was not some great intervention in the course of history, and that prayers don’t really do anything. Uh oh. The Calvinist theologians of Holland attacked him: Besides this untraditional idea of deism and a mechanical universe, as a good Catholic Descartes also believed in free will, which doesn’t jive well with Calvinist predestination (the idea that God knows exactly who is going to hell or to heaven). His friends, fortunately, intervened on his behalf. In 1649, Descartes was invited by Queen Christina of Sweden to tutor her majesty. Unfortunately, she wanted him at five in the morning three days a week, through sleet and rain and snow. Descartes caught pneumonia and died in 1650, at the age of 54. I should add a little note on education during these heady times. In the 1600’s, despite all the great scientists and philosophers, about 80% of the population was illiterate. (Not the modern "functionally illiterate," meaning they are not very good at it, but totally unable to read and write.) Nevertheless, change was coming. For example, in 1619, the Duke of Saxe-Weimar (in Germany) ordered compulsory education for all children between six and twelve years old, with a month of "vacation" at harvest time so they could work on the farm - practically the same system we have today, including the summer vacation! John Comenius (Jan Komensky, 1592-1670), a bishop of the Moravian Brethren, wrote the first printed textbook (illustrated, no less) which was used for 250 years. In the Didactica Magna (“Great Art of Teaching”), he outlined principles of education that could be used by most any schoolboard today. Take a look at a few by clicking here! Note, however, for all the religious reform and scientific progress, over one million people, mostly older women, were executed as witches from the time of the Papal Bull concerning witches, issued in 1484, through the 1700s. There was even a witch hunting manual first published in 1486 called Malleus Malificarum ( the Witch’s Hammer) - how to recognize them, how to torture them into a confession, how to effectively kill them.... Women continue to be mistreated today, of course, although we seem to be coming to our senses as the world moves into the second millenium. Note as well that slavery, which was a minor issue in the Middle Ages (what with the convenience of serfs), had resurrected its ugly head with Spanish and Portuguese conquest of vast areas of Africa and the Americas. Many people in Spain (where else?) believed that no decent Christian should perform manual labor! Protestant nations and their colonies found the practice of slavery equally profitable. Although slavery still exists in some third-world nations, it has died out in most of the world, mostly because the industrial revolution made it too costly, not because we were offended by the practice.